i knew that our Davao trip won't end without one more adventure as we actually left our itinerary on our last day open to any activity. but i never predicted that it will be something like our Maxima experience. 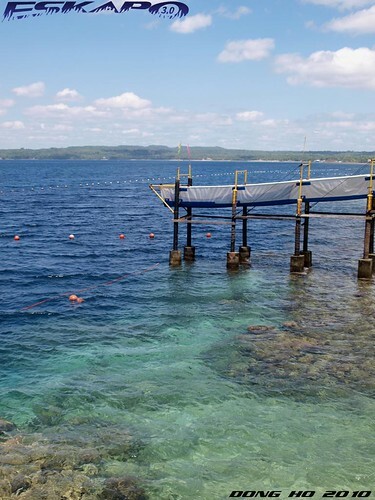 an addition to Davao's long list of adventure activities is Maxima Aqua Fun located mid-West of the island of Samal. 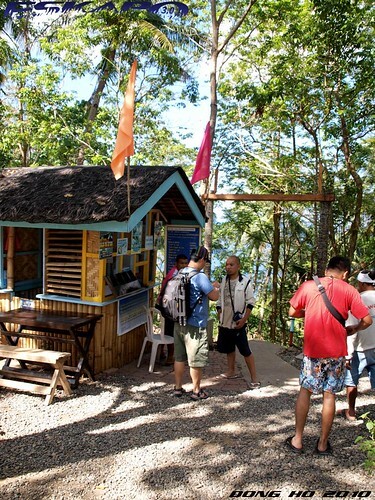 offering coastal and water activities with a bonus of having a canopy walk. going back as to how we ended up choosing this activity, when we were in Gensan the bloggers there introduced us to the Davao bloggers who were also there supporting the Kalilangan Festival. 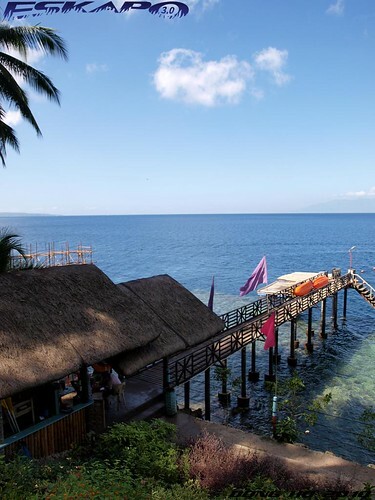 they learned that we were going to Davao the next day, so Ria and the rest recommended us Maxima in Samal island. 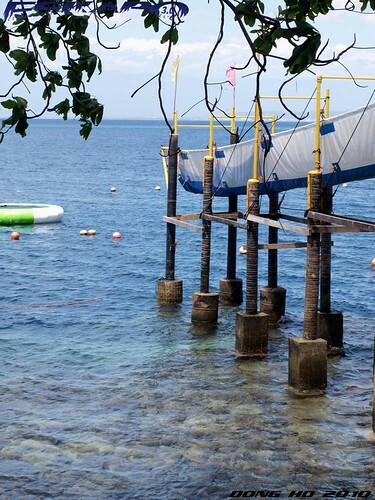 they mentioned about water activities with a long tarpaulin slide as the highlight. how can we resist that? we reached the place by renting motor bikes from central Babak district. ride took about 30minutes passing by the town of Penaplata. part of the route is a rough road leading to a downhill area. when we saw the coast and the slide, we didn't waste our time as it was this type of activity that we were looking for. 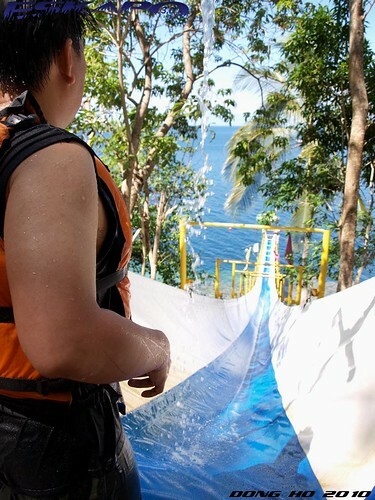 i tried a similar mud slide in Pugadlawin Batangas during ROAM magazine's treat for us and i found it exciting. so how can this be different? 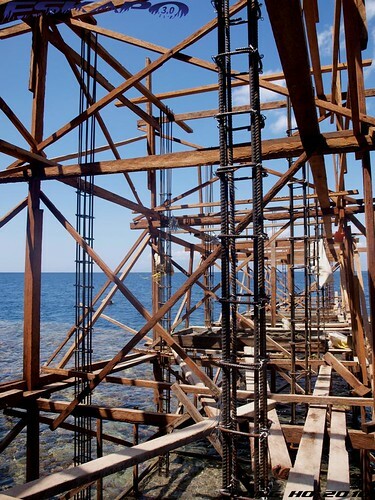 we will end by falling on a 120-feet sudden deep sea water. a challenge i never tried but dared. we were given our life vest as no one is allowed to slide without it. looking at the sign "Do it at your own risk" on the platform, adds thrill to this slide. i volunteered to do it first yet seconds before sliding, i still felt the sense of fear. made the drop and it was fun all the way down. extreme fun. 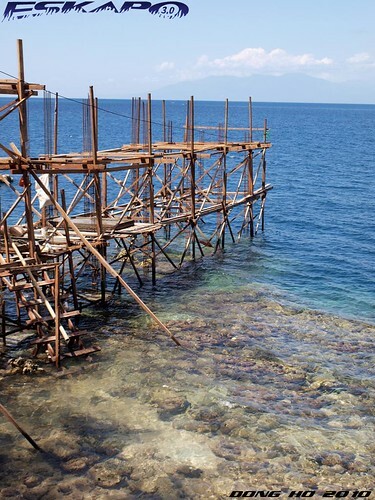 we swam back to the wooden pathway back to the platform and made another plunge. until i ended doing it five times and if not of the long way up, we could have done more. on one side, we noticed that another slide was being constructed. it actually looks like a longer and steeper slide. 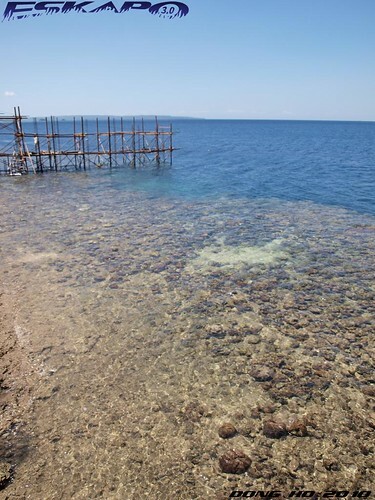 something that we can look forward the next time we visit Davao. a good reason to come back. 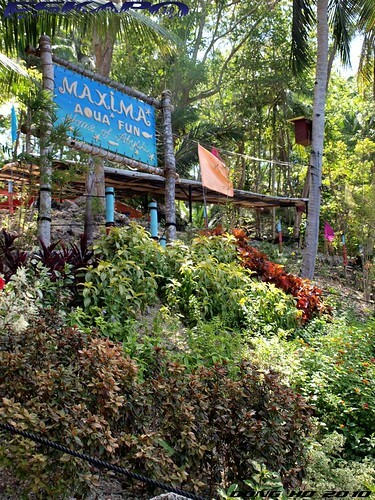 special thanks to Sir Sonny Dizon owner of Maxima Aqua Fun Davao for giving us a day pass to this adventure through the recommendation of Davao blogger and new friend Ria. 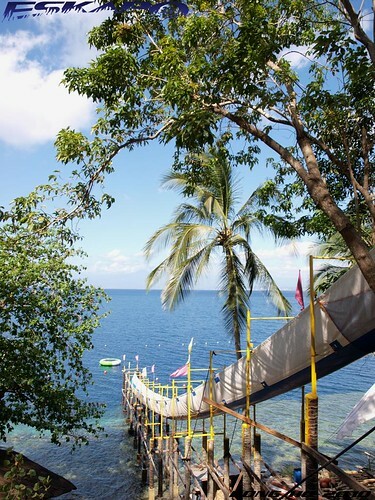 for reservations, you may call Maxima Aqua Fun (082) - 282-2339 or (082) - 271-2626. other activities available are kayaking, snorkeling or plain swimming in the clear waters of Samal. note: canopy walk is only open on weekends. You are a brave man ! Fearless! napanood ko yan sa trip na trip! afraid ako sa mga ganyan kaya di na kami nag try haha. clap clap clap for you dom! Looks like you all have great fun. The slide is too much for me...lol. I will give it a miss. wow saya! ill definitely try that when im there! wow! hindi ako marunong lumangoy pero as long as may life jacket eh gusto ko din yan i-try! kainggit! First time I see a slide in such a beautiful place. 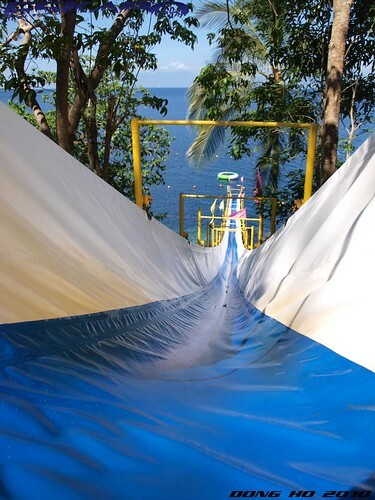 nainggit ako sa giant slide! napanood ko din yan sa trip na trip.. I wanna try this one...soon! 120feet? (woot) looking back at your photos, mukhang 5 feet lang haha.. diko kaya.. haha..
That looks like the ultimate fun time, my friend. Gorgeous and bright and beautiful. 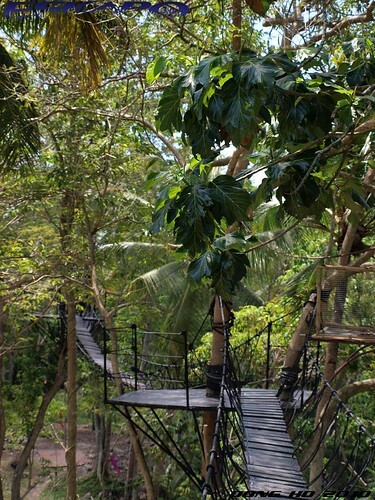 Canopy walk would always look exciting! 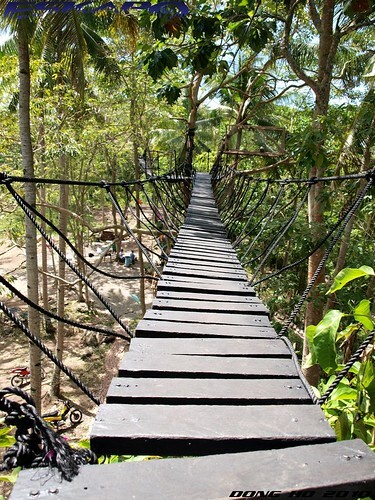 Pero the last time I walked on a short hanging bridge, kinabahan na agad ako. Haha! 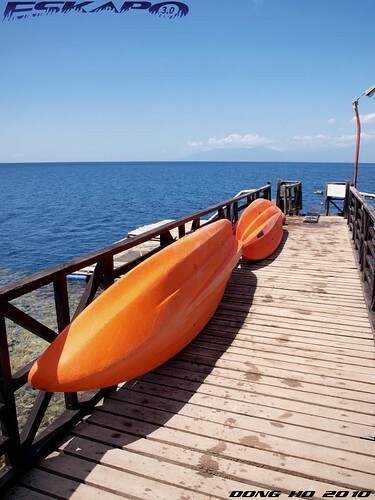 Wow, your appetite for fun and adventure is amazing. I'm sure a lot of you enjoyed the adrenalin rush.